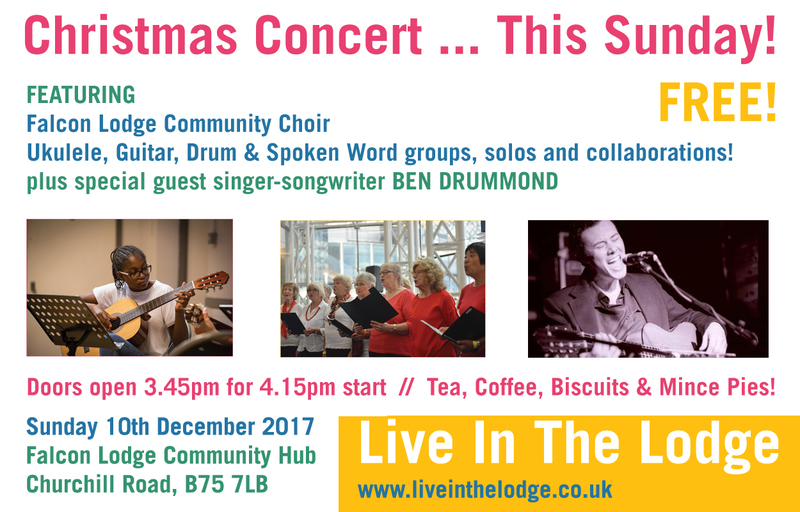 Join us for the free Live In The Lodge Christmas Celebration, featuring our largest number of performers from the local community to date! Nearly 60 people will come together from the local community playing ukuleles, spoken word, guitars and drums – many for the first time – along with new djembe and improvisation groups and, of course, the FL community choir! 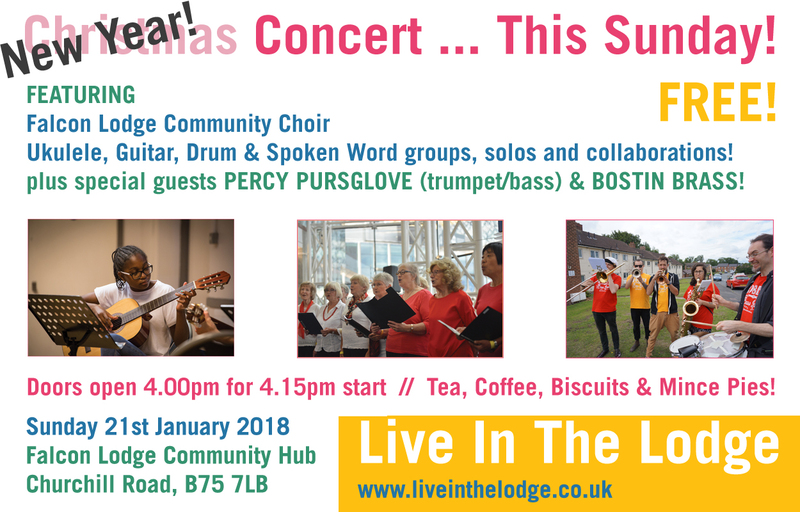 Professional artists, including bassist/trumpeter Percy Pursglove, who has performed with the likes of Jamie Cullum, Gregory Porter and Amy Winehouse, will be playing alongside our Live In The Lodge musicians, as well as acoustic guest musicians popping up throughout the afternoon. Come along, have a mince pie (kindly donated by Asda) and support lots of brilliant community music! Spring Concert – this Sunday from 4.00pm! With special guests Lluis Mather (bass, sax, flute), plus a set from the brilliant Sam Frankie Fox and Ricardo Rocha, playing good-vibe world and folk music on a whole host of instruments and vocals, from guitar to harp! Please bring a friend, spread the word, and support all the dedication and hard work of all our instrumentalists, singers and young musicians. Author liveinthelodgePosted on 21st April 2018 Leave a comment on Spring Concert – this Sunday from 4.00pm! Author liveinthelodgePosted on 22nd March 2018 Leave a comment on FL Community Choir go Congolese! 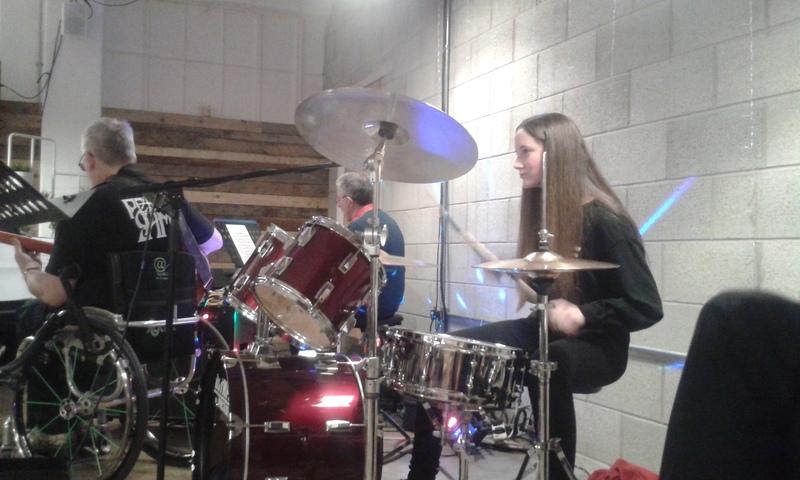 … who has been learning drums with Joe for the last year, on her brilliant first gig in Erdington a couple of weeks ago with musicians at Oikos Cafe and CAFE Arts Forum … hopefully you’ll be able to catch her again soon at our April concert in the Lodge, before she starts charging appearance fees! Sadly it looks like we’re going to have to cancel this afternoon’s Christmas extravaganza – if you look out of the window you’ll probably guess why! All very annoying … apologies for the inconvenience. We should be able to reach most people performing, but please can you pass this message on to friends and anyone you know who was planning to come along too. However, this does mean we can extend Christmas into 2018 and have our concert then! Have a safe, warm day – and hopefully see you all on Wednesday for our final session of the year, where we can arrange a new concert date for January. LITL Christmas Special – this Sunday! Author liveinthelodgePosted on 9th December 2017 Leave a comment on LITL Christmas Special – this Sunday! Come and join in with free music in Falcon Lodge! 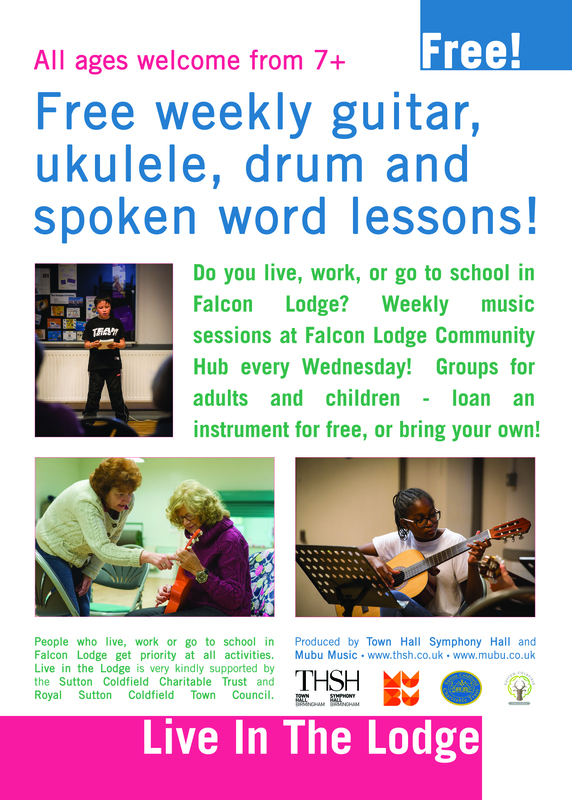 We’ll be starting new free classes and lessons in guitar, ukulele and drums later this month, for both children and adults, all on Wednesday afternoons and evenings at the Community Hub in Falcon Lodge. If you’re interesting in coming to try out a new intrument, just drop us an email – hello@liveinthelodge.co.uk , say hello on Facebook, or call the Town Hall Symphony Hall Community office (Mon-Fri) on 0121 644 6051 and we can put the best times together for everyone. 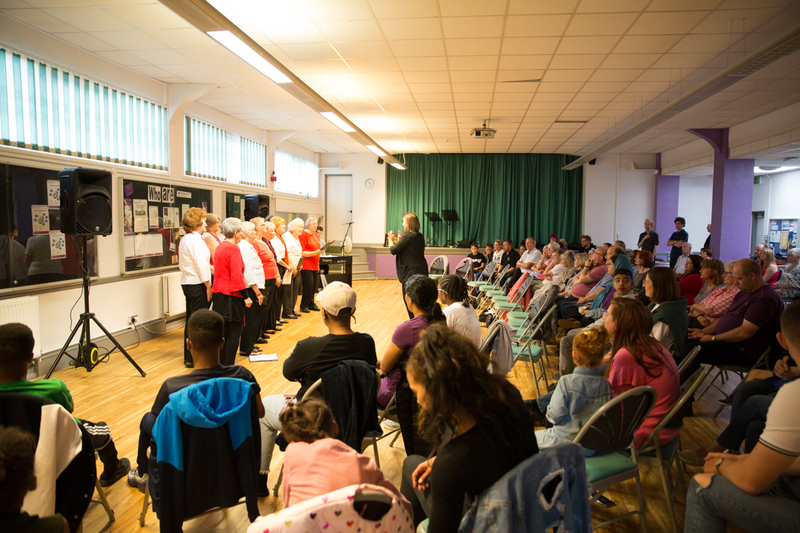 We also have a lovely Community Choir, which meets every Wednesday evening … it’s free to join, very friendly, fun and informal! Be great to welcome you along. 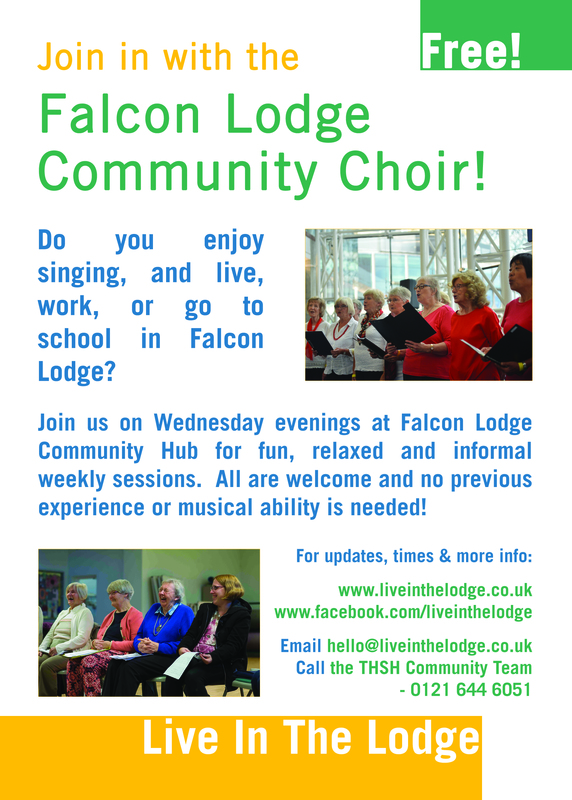 Let us know if you need any other info or have any ideas for more music in Falcon Lodge, and we’ll try and make it happen! Author liveinthelodgePosted on 13th October 2017 13th October 2017 Leave a comment on Come and join in with free music in Falcon Lodge! This Saturday – LITL Summer Concert! 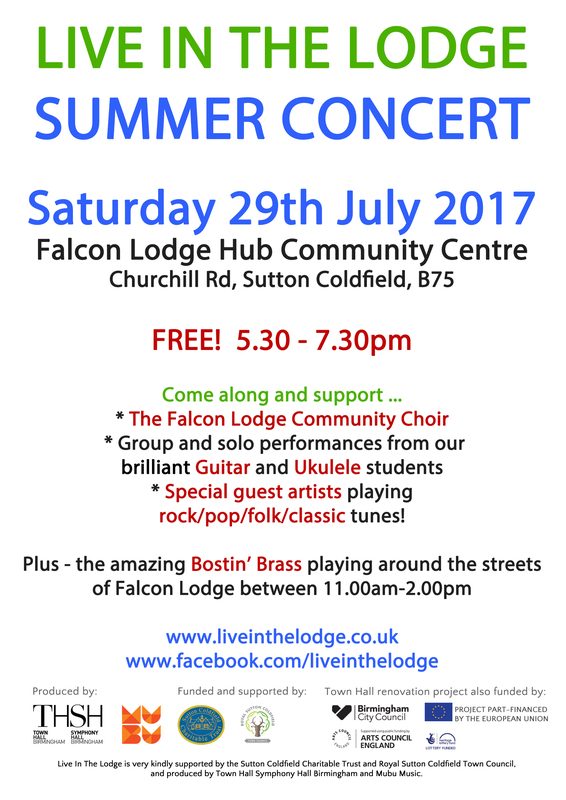 Author liveinthelodgePosted on 24th July 2017 24th July 2017 Leave a comment on This Saturday – LITL Summer Concert! Drums – as usual, let us know if you want to change or swap times, or if anyone new wants to come along at any time. We currently have the 3.30-4.00pm slot free, so just drop us a message if you want to come along then.